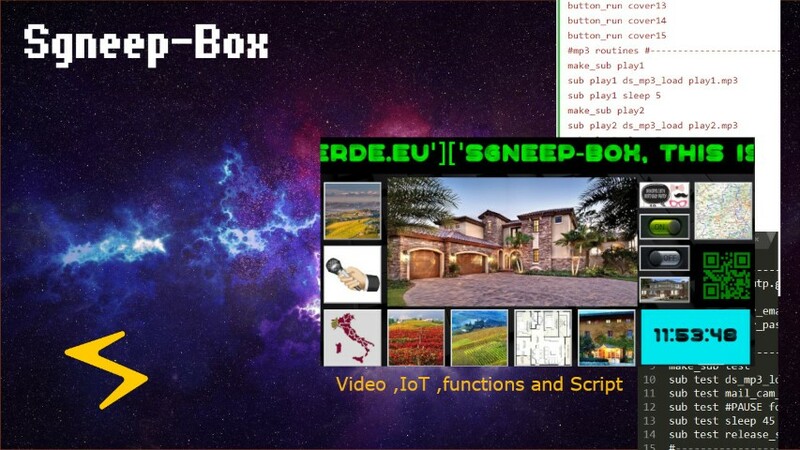 "You just have to imagine and, everything can create ...."
It may seem like a slogan, but Sgneep-Box OS with its script interpreter simplifies the IOT / MTM world. Smart House, Smart City, Domotics, Hydroponics, Industry 4.0, SCADA Systems,....,today with Proximity Marketing Wifi and Gamification .... connected to lights, video, Mp3 and even more, pollution only more imagine! Don't limit your creativity, offer your world and integrate it into the world that is being born, you can be a pioneer.
'' Sgneep-Box '' is a Debian-based operating system ,opensource and scalable for any electronic boards with ARM/Intel CPUs. Machine-to-Machine (M2M) applications allow computers, industrial machines, home appliances and other devices to network and communicate with each other. 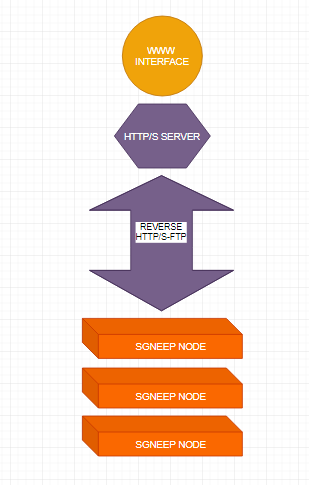 SGNEEP NODE allows SGNEEP-BOX to connect to the cloud (support WebApp,API,ReverseHTTP/S) and instantly benefit from remote control and monitoring capabilities, data collection, graphical display, interface buttons and GPIO port output. With Sgneep-Box OS you can create Digital Signage(DS), Kiosk or SCADA systems. Now you can easily add buttons, audio, video, email, camera DSLR and much more. Novel use of gamification in a video. Building interactive video experiences has never been easier. You can also control 20 digital outputs (programmable with Sgneep-Box Script) to control IoT devices that manage actuators and sensors, at the same time you can collect data from Sgneep-Box WifiBeacon and analyze them in real time. Now you can combine Interactive Video, IoT, Kiosk system and Proximity marketing in a single device managed by Sgneep-Box OS. Sgneep Wifi-Beacon is able to understand the distance of WiFi devices within a certain area. The control panel of each Wifi-Beacon allows to obtain a more precise distance by setting the parameters to optimize the FSPL(Free-Space path Loss). Progressive Web Apps (GOOGLE PWA), is the solution that wants to combine the best of native apps and Web technology. Easy Script, powerful features, and the freedom to build anything you want. Sgneep-Box allows you to connect video devices, webcams, check or read the status of the sensors connected to the GPIO port; playing music and videos will not be a problem. Whether it is the garden sprinkler or the Multimedia Kiosk / IoT develop the software will be very simple and in a very short time. Try the script demos included in Sgneep-Box OS, you can easily start with these examples and expand them as you prefer or use the code fragments found on this page. Sgneep-Box is able to stay synchronized with your ftp server, so you can remotely update the entire sgneep-box script, images and audio and video files. You can also configure your smtp server, like GMAIL, to send images taken by a professional DSLR camera. Sgneep-Box Script allows you to write many applications, be it DS or KIOSK, Proximity Marketing or Gamification.